At the moment I am breaking in some new Falcon Hunter bowls, in the past I had the standard dark stained bowls and to the best of my memory they were a pain to break in, they smoked and tasted green for quite a while before they settled down. The new Hunter bowls I'm breaking in now are smoking fantastic from the first bowl and very neutral tasting, I can actually taste and enjoy the tobacco as I break in the bowl and know it will only get better with time. Have any of you noticed a difference between the different bowl types when breaking in a new bowl? Do you prefer the Classic or the Hunter bowls? I like the Hunter bowls myself. Thanks for your input and I look forward to hearing about your experience breaking in Falcon bowls. Hunters are pretty quick to season. I feel they're nicer to the smoke flavours than the dipped briars. I can't speak to meers, I've not had one of those. Hunters are pretty quick to season. I feel they're nicer to the smoke flavours than the dipped briars. I can't speak to meets, I've not had one of those. I agree Ozark, these bowls are breaking in easy and they should be good to go in no time. a quicker break in period. so there was no issue. Most of mine were used when I got them too. A good chamber sanding and a quick wipedown was all they needed. Over the years I've collected every Falcon bowl and to be honest I've never had a problem with any of them during the break-in process. You may want to read the below link, it may help. Thanks Ray, I don't have a problem breaking them in per se only that I find the Hunter bowls break in much easier than the stained bowls and taste better too. Thanks JRobert, I read that back in the old PSF when Falconeer posted it, he knew his Falcon pipes. I miss reading his posts. Do briar Falcon bowls (new) ever come in around .84 ( or less ) and 1 1/2" deep? All I see are 1" or so deep. Not really interested in the chimney tall ones - just a tad deeper. The Hyperbole is close. I don't have one. I always find the hunters easier to break in, possible due to no staining, once you get the first hand full of smokes out the way on the normal bowls they are as sweet as a nut. my break in is 2 half bowls 2 3/4 bowls then onto full bowls. I've found after the 2nd full bowl, the draw is a bit restricted so that's when I ream the smoke hole on the bowl after that brilliant smokes all the way. found one - .75" X 1.53"
I agree, the Hunter bowls break in easily but I break mine in smoking full bowls, haven't had to ream the smoke hole yet and have smoked well over a dozen bowls through the ones I have broken in already and the draw on mine are good. They have burned everything I smoke in them to ash so far, still have several new bowls to break in though. 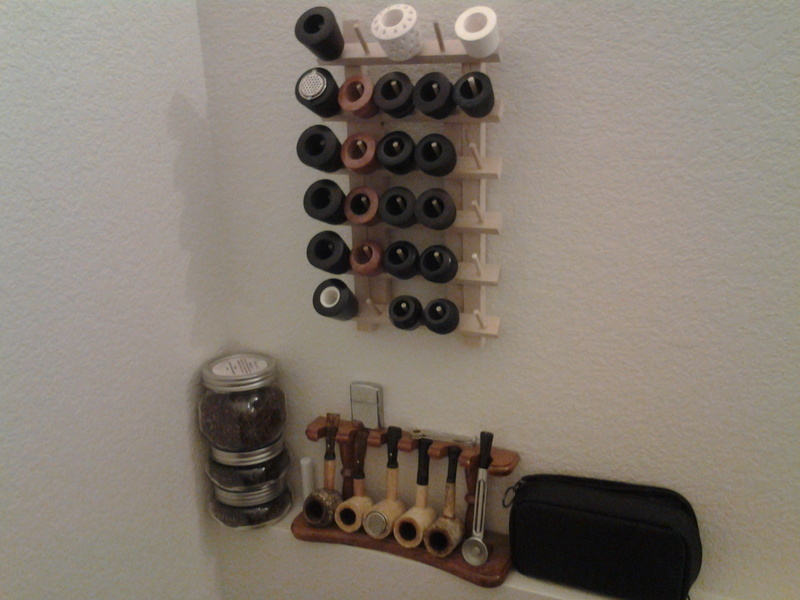 The Hunter bowls do seem to smoke a lot better than my old classic stained bowls and I am pleased with my new set up. I noticed the same between the Hunter and Standard bowls. Over time, if your draw starts to tighten, open up the bottom of your bowl with a little sand paper. the classic bowls do vary though, some I have broken in have been a dream no green issues and smoke beautifully, i have had some that are a bit vile during break in but it is few and far between, on the other hand I find the alco bowls the worst offenders started the break in of one last night and it was borderline horrific....but the effort does pay off ten fold. All it says is Dublin Hunter.